The family Procellariidae is a group of seabirds. 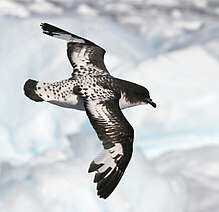 It is made up of the fulmarine petrels, the gadfly petrels, the prions, and the shearwaters. This family is part of the bird order Procellariiformes (or tubenoses), which also includes the albatrosses, the storm-petrels, and the diving petrels. This page was last changed on 19 November 2013, at 07:52.